Revalidation is a fundamental change to the way nurses in the UK will renew their registration. It involves new requirements and new ways of collecting evidence to prove you can practise safely and effectively. That is why Coloplast and RCNi have joined together to provide a collection of resources, including templates and examples of how you as specialist nurses will be able to successfully complete the revalidation requirements. In addition, we include reflections from nurses at the pilot sites where revalidation has been tested, giving you an insight into how the process will work in practice. Specialist colorectal nurses offer their views and flag up some of the challenges you may face in putting together a portfolio that satisfies CPD, feedback and reflective practice needs. 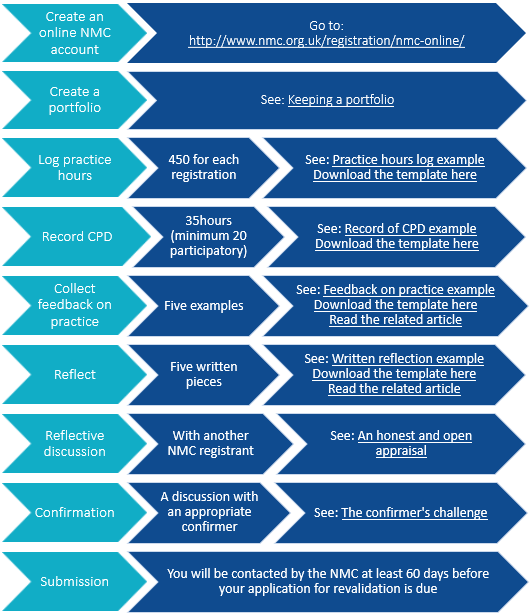 You may already be fulfilling all the new requirements, such as reflective practice. It may be just a case of making sure you are collecting your evidence in a way that make revalidation straightforward. The NMC has provided guidance and forms to use at various stage of the process, available in the following booklet. We have also provided templates to show you how information should be recorded in your portfolio along with some worked examples from specialist nurses. You should be care not to record any information in your portfolio that may identify an individual, whether patient, service user, colleague or another person, living or dead. Advice from nurses who have trialled the process is that you should ‘start now’ with revalidation, and using these resources will help you get under way.